Police cited numerous infractions in a March compliance check. Oak Bluffs Police Detective James Morse presented selectmen with a long list of code violations by LoFT, the bar and adult game room on the second floor of the Martha’s Vineyard Chowder Co., during a public hearing convened at their regular meeting Tuesday night. 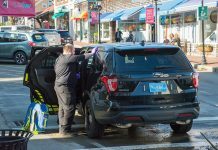 Detective Morse told selectmen that he first learned of the new establishment, formerly Dreamland, in a story published in The Martha’s Vineyard Times. Mr. Morse said that in following through on his duties as a license compliance officer on March 20, he found the blueprint on file listed no amusements, and that neither a change of use permit nor an entertainment license had been issued. Mr. Morse said his search also showed that no certificate of occupancy had been issued by the building inspector. Likewise, a fire inspection certificate signed by Chief John Rose was not on file. 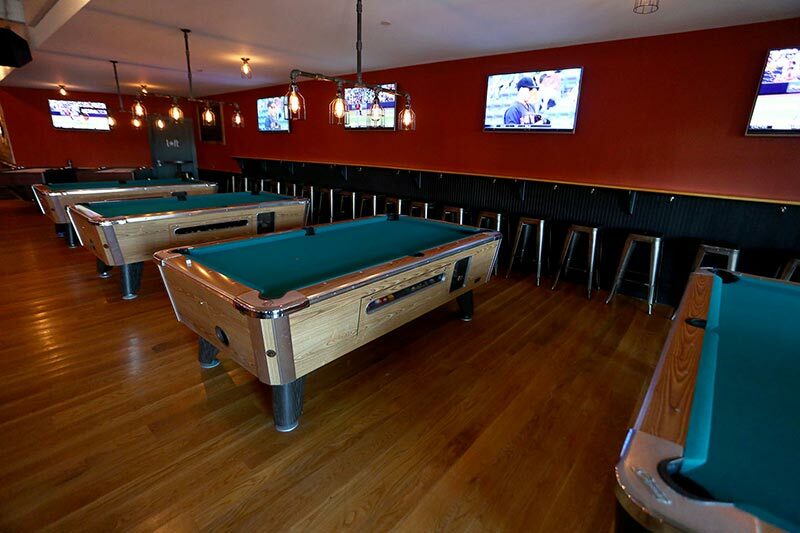 Mr. Morse said he made a spot check of the bar/adult game room on Saturday evening, March 21. In addition to a number of minor infractions regarding the display of certificates, he told selectmen he saw alcohol served to impaired patrons — one who was boisterous and stumbled “in a serpentine manner,” and one who was drifting in and out of consciousness. He noted that the manager eventually asked both patrons to leave. Mr. Barbadoro said he spoke with the building owners about it, and that as of yesterday, the staircase had only been partially reassembled. “We have to come up with a plan for rebuilding it,” he said. The building is owned by C Vivor LLC, which is owned by Mark and Mike Wallace. Selectman Walter Vail asked, given the extent of the violations, why LoFT had not been closed. Det. Morse said it would take “a riot” for the police to shut it down, but that the fire chief or the board of health could close it immediately if they saw fit. LoFT proprietor J.B. Blau was not able to attend the hearing due to illness, Mr. Whritenour said. The Wallaces also did not attend. 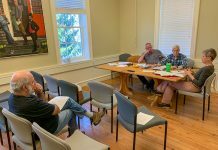 Office administrator Alice Butler said a certified letter was sent to the Wallaces regarding the matter, but the town had received no response prior to Tuesday night’s meeting. “It seems to me these people have been in business a long time and should know better. Right or wrong, I feel like we’re being avoided tonight,” Mr. Coogan said. Police Chief Erik Blake said there was no excuse for the lack of a change of use permit. “He’s been in business 28 years; he should know better,” he said. Town administrator Robert Whritenour said due to the “far-reaching” nature of violations, the hearing should be kept open to allow for additional testimony. The selectmen voted to continue the hearing on Thursday, May 7. Brothers Dan and Greg Martino gained final and unanimous approval from the selectmen for an aquaculture license that will allow them to operate a two-acre oyster farm off Eastville Beach. Although the selectmen voted 4-1 to approve the license in September 2014, a lawsuit filed by seasonal resident Jeff Ludwig in Suffolk County superior court on Oct. 15 put the final outcome in doubt. The complaint alleged that the selectmen failed to conduct a comprehensive review of the project, and cited concerns about safety for swimmers and boaters, and excessive noise, as well as aesthetic concerns. In negotiations with town counsel Michael Goldsmith, the litigants, through their attorney, agreed to drop the appeal if the Martinos agreed to a set of conditions related to summer hours of operation, noise mitigation, and emergency contingency plans. The Martinos had agreed to the terms prior to Tuesday night’s meeting. It will be the first commercial oyster farm in Oak Bluffs. “This is certainly a relief to everyone involved,” Mr. Coogan said. In other business, selectmen unanimously chose Michael Santoro to be the next board chairman. Upon his acceptance, Mr. Santoro nominated Gail Barmakian to be vice-chairman, citing a long and productive relationship with Ms. Barmakian. The board voted unanimously to appoint Ms. Barmakian. “Hopefully that means you’ll be chairman next time,” Ms. Burton said to Ms. Barmakian. An earlier version of this story referred to LoFT as LoFT 21+. The correct name is LoFT.